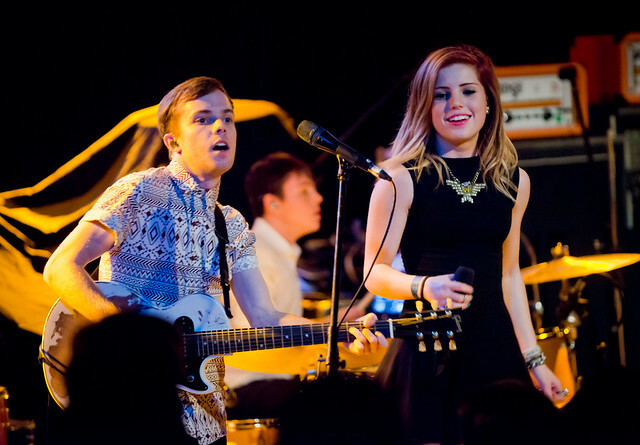 Echosmith (Sydney and Noah) perform at The Roxy. Echosmith's ages range from 14 to 20 but they play like veterans of the stage which isn't surprising once you've learned they've lived and breathed music from an early age. And last Tuesday at The Roxy, supporting Tonight Alive, they certainly played like the stage was their second home rousing the crowd with the opening "Let's Love" and then weaving into their hit single "Come Together" while Sydney busts out the twirling pastel parasol during "Talking Dreams" in what's become a welcomed staple for the song. 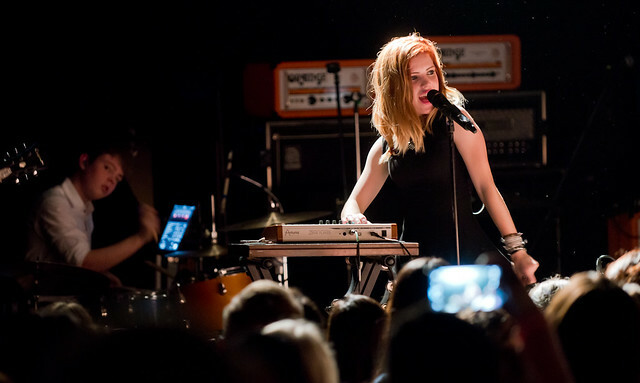 Echosmith's Jamie, Graham and Sydney took their band to the Roxy to open for Tonight Alive. With confident stage presence, Jamie and Sydney led sing-alongs to their teen anthem "Cool Kids" while the crowds surged into a lively clapfest to their closing song "Nothing's Wrong." For those not familiar with Echosmith, they're a group of siblings who grew up in Los Angeles and, unlike most teen pop bands whose sounds embraces sugary, bubblegum pop, Echosmith, comprised of Sydney, Jamie, Noah and Graham, sound more mature, blending a sophisticated sound that borrows from Coldplay, U2, Mumford and Sons and The Smiths. Echosmith just finished their tour with Tonight Alive and will return to SoCal to play The Chain Reaction on Dec. 21st and 22nd. NEW VIDEO: ALVVAYS' "ADULT DIVERSION"